Four Torah scrolls - two of which survived the Holocaust - will be introduced to the Great Synagogue of Tel Aviv in a special ceremony. 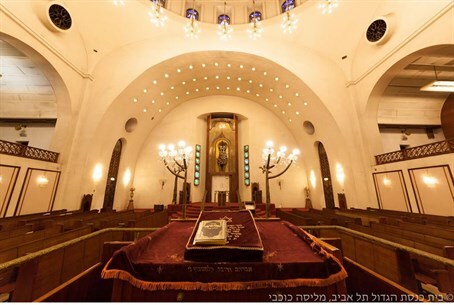 For the first time in over 30 years, the Great Synagogue of Tel Aviv will accept new Torah scrolls into its collection. A ceremony to mark the occasion will be held in two weeks. The four Torah scrolls - two of which survived the Holocaust and went through a special process of repair and restoration at the hands of expert scribes - will be put into use at the synagogue. The local businessman who donated the Torah scrolls to the Great Synagogue is also planning the event, which will include a large procession starting at the corner of Nahalat Binyamin Street on Rothschild Boulevard all the way to Allenby Street, where the synagogue is located. A large stage has also been set up on Rothschild Boulevard for the ceremony marking the writing of the final letters. The ceremony will also serve as the opening salvo for festivities marking the recently restored synagogue's 90th anniversary. Notable attendees will include the Chief Rabbi of Tel Aviv, Rabbi Israel Meir Lau; Knesset Speaker Yuli Edelstein; Tel Aviv Mayor Ron Huldai; chairman of the city's religious council, Eldad Mizrachi; and various other ministers, MKs and rabbis. Tel Aviv Chief Cantor Chaim Adler and the Ra'anana Symphony will be among those performing at the event. "The Great Synagogue of Tel Aviv, which has served for decades as a magnet and beacon of the city, underwent a great revival last year and accepts congregants from all classes and ethnic groups," synagogue president, Shlomo Pivko said. "I am excited for the privilege to host this unprecedented historical event marking 90 years in the most obvious way there is: adding four new Torah scrolls to our collection. I have no doubt this unique event will reinforce the synagogue's restoration to its former glory."